Social anxiety disorder involves overwhelming worry and self-consciousness in everyday social situations. It is a type of anxiety that often centers on a fear of being judged negatively, contributing to a low self-esteem and self-worth. Generalized anxiety disorder involves excessive and unrealistic worries, tension and fear, whether or not there is anything to provoke the anxiety. You are constantly on edge, anxious and worried, and it’s disrupting your life. Panic disorder strikes suddenly, with no warning, instilling racing thoughts and feelings of terror in a person that feel like they will never go away. The panic is accompanied by physical conditions such as chest pain, sweating, shortness of breath, dry mouth, dizziness and a racing heartbeat. Post-traumatic stress disorder (PTSD) is an anxiety disorder that comes after a traumatic event has occurred. Those living with PTSD often must get outside help because PTSD can affect people for years after the event occurs they may be confusing to the person with OCD as well. It is similar to the familiar children’s rhyme, “Step on a crack, break your mother’s back.” A person with OCD may convince themselves of something as unlikely as that, but holds onto it as if it were engraved in stone. Specific phobias: A specific phobia, such as agoraphobia, the fear of open spaces, is an intense fear of a specific object or situation, such as spiders, heights, or certain locations. A person may begin to avoid common everyday situations, or avoid meeting with friends or attending group functions because of their fears, even though it is usually not realistic. 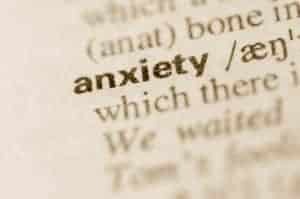 The exact cause of anxiety disorders is not known, but it is believed that it may be connected to having poor self-esteem or a poor sense of self-worth. Anxieties can crop up when a person has internalized too many negative thoughts and emotions about themselves for too long. They judge themselves by the approval of others, and when they don’t get that approval, they harbor it inside themselves, thinking they’ve done something wrong. This can lead to depression, as well as anxieties of different types. There are no specific tests for any anxiety disorder, but a doctor may refer you to a psychiatrist or therapist to help you undo the bee’s nest of negative thinking that is knocking around in your brain. The goal in treating anxiety is to replace the negative thoughts with positive ones, which will hopefully help improve your self-esteem and help you to see the world in a better light.